Gillian Maxwell is based in Vancouver, BC, Canada. She is an experienced coach and facilitator, public speaker, and knowledge exchange broker and has been dedicated to the reform of drug policies nationally and internationally since 1999. 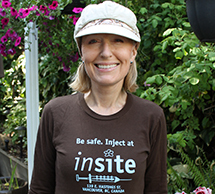 She is a board member of MAPS Canada (Multidisciplinary Association for Psychedelic Studies), and a proud recipient of the 2012 Queen Elizabeth II Diamond Jubilee Medal for community service in introducing harm reduction to Vancouver and advocating for INSITE, North America’s first supervised injection site. Gillian is committed to raising consciousness and supporting its manifestation into the world. She feels that plant medicines play an important role in our ability to develop an authentic presence in the world that values love and compassion. She has extensive experience over a decade of working with entheogens in a ceremonial and traditional context, and brings this depth of knowledge, along with innate intuition and wisdom to her work as an Integration Coach. A long-time resident of Strathcona, she lives happily with her beloved husband, Richard, their (spirit guide) dog, Brandy, and is the proud step-mother of two grown children.